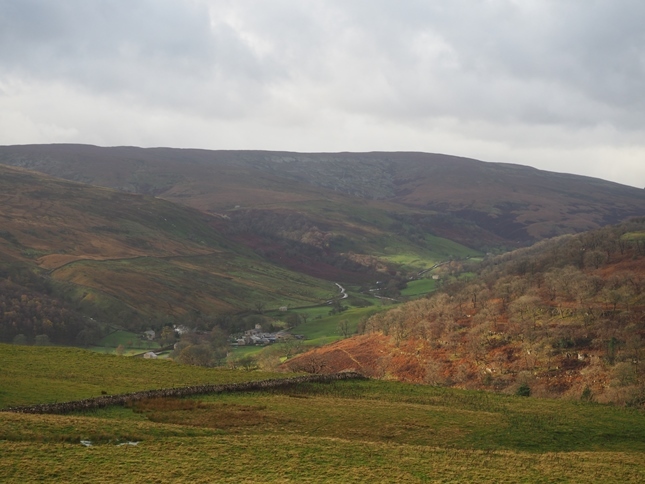 Horse Head Moor is one the high fells dividing Littondale and Wharfedale and fails by the smallest of margins to reach the 2,000ft contour. 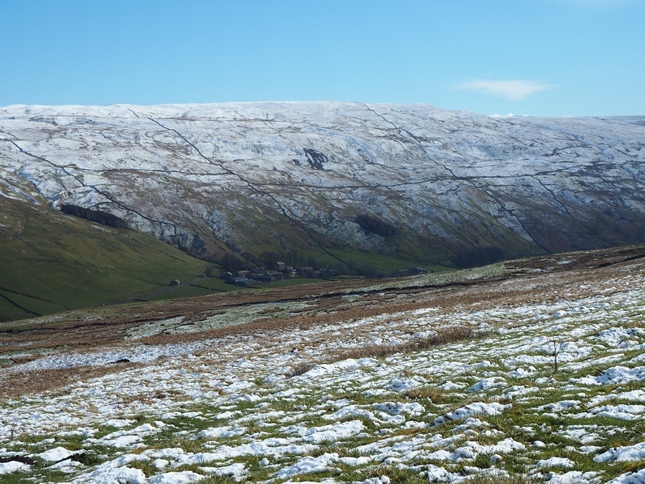 Horse Head Moor lies over halfway along the thirteen odd mile ridge that divides Littondale from Wharfedale and Langstrothdale. 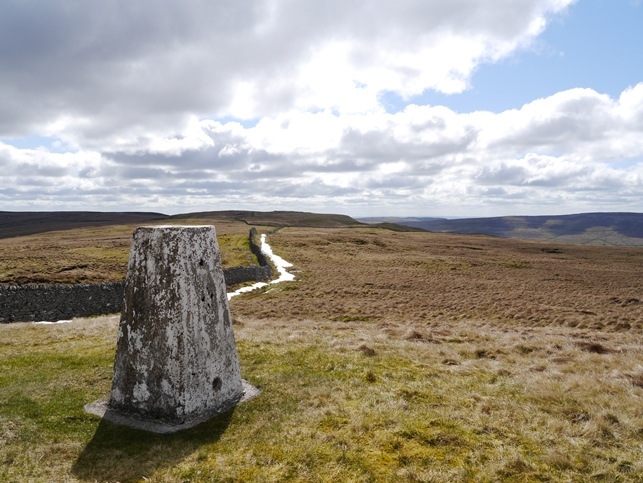 Horse Head Moor was once believed to be the highest point of the ridge. However, a survey in December 2012 proved that neighbouring Birks Fell was about 70cm higher. While Birks Fell was upgraded to mountain status poor old Horse Head Moor was deleted from the list of Marilyns. Horse Head Moor sits roughly between Halton Gill in Littondale and Yockenthwaite in Langstrothdale. These two small settlements provide the best starting points for a walk up to the summit. 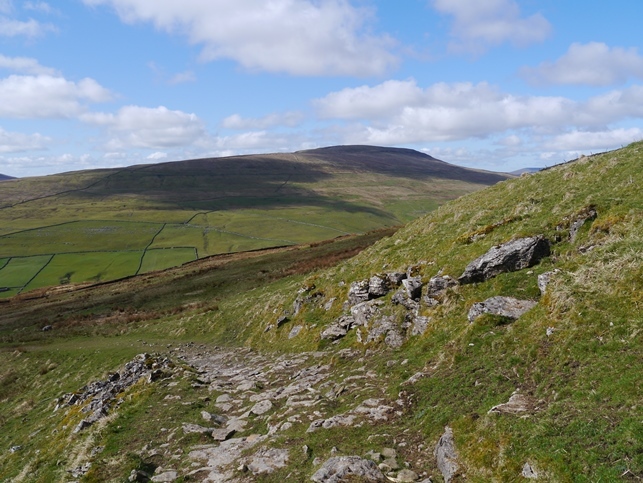 The paths from both converging at Horse Head Gate on the ridge top. From Horse Head Gate it is then a fairly easy walk south on a thin path following the left hand side of the wall. With only 19m in height to be gained from Horse Head Gate to the summit the only real difficulty is the occasional peaty bog. 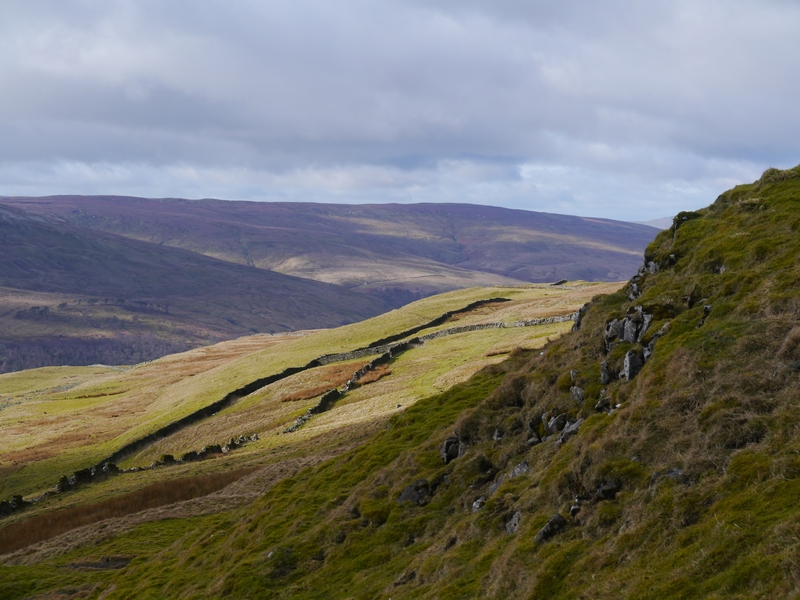 An alternative approach from the south utilising the Buckden to Litton bridleway tends to encounter more boggy ground north of Birks Fell. Two cairns either side of the summit wall seemingly vie for the right to be the highest point. The larger cairn on the west side of the wall is the more impressive and has a superb view of Fountains Fell, Pen-y-ghent and Ingleborough. 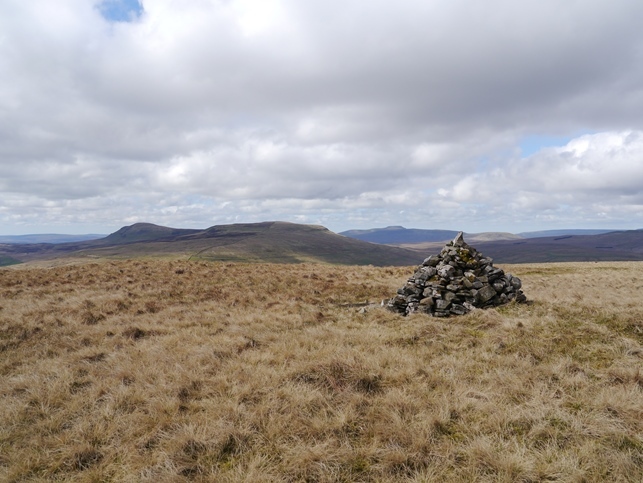 The smaller cairn on the eastern side of the wall favours a view towards Buckden Pike. 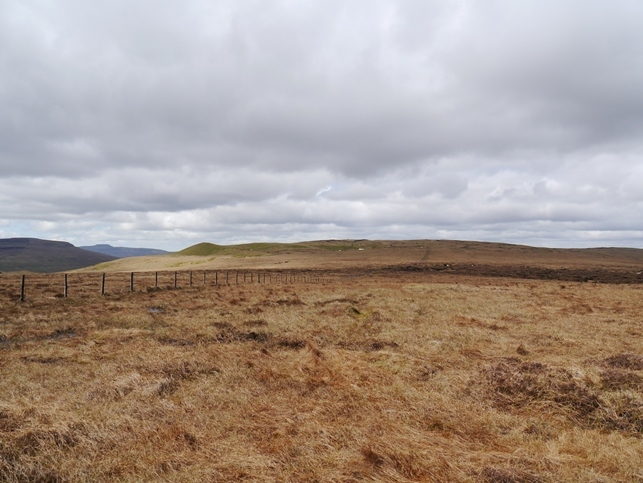 According to the Database of British Hills the highest point is actually an unmarked spot 30m north of the small cairn. Just 6cm higher than the base of the small cairn and 35cm higher than the base of the larger cairn I’d suggest only the most fanatical of hill baggers would prefer this spot to one of the cairns. Perhaps more satisfying as a summit to all the above is the Ordnance Survey trig point which can be found north of Horse Head Gate. 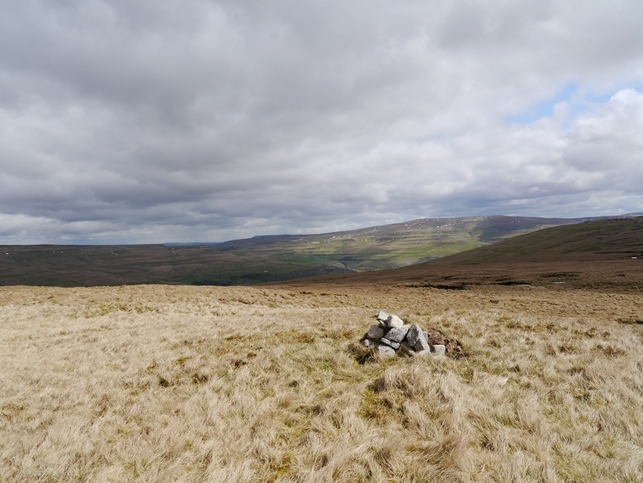 The view from the trig point to the Yorkshire Three Peaks is superb and, until I discovered the view from the Cosh Outside trig point further along the ridge, the Horse Head trig point was my favourite in the Dales. One feature of Horse Head Moor that I’ve not yet visited is Sugar Loaf. Clearly seen on the approach from Birks Fell it is a grassy limestone knoll to the south of the summit. Whether it is worth visiting or has any features of interest is something that I hope to find out next time I visit.